SEATTLE (AP) Clint Dempsey matched Fredy Montero with one important goal for the Seattle Sounders. 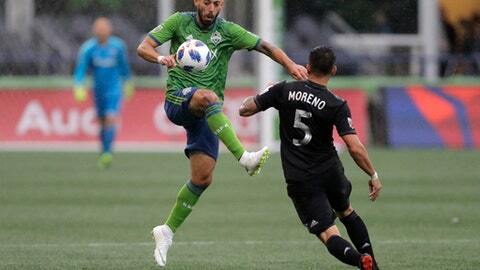 Dempsey scored in the 22nd minute for his first of the season, helping the Sounders pull out a 1-1 tie against the Chicago Fire on Saturday night. Dempsey tied Montero for the club record with his 47th regular-season goal. It was Dempsey’s 57th goal across all competitions for the Sounders, three away from Montero’s overall mark. ”It has been a tough year for me personally and for the whole team,” Dempsey said. ”We’ve had a lot of injuries and it has been difficult to create chances. Harry Shipp started the scoring sequence for the Sounders midway through the first half, taking the ball up the attacking right side. He sent it ahead to Will Bruin, who took it to the top right corner of the 6-yard box. Bruin tapped the ball across, and Dempsey slid into it, sending his shot into the upper left side. The play helped Seattle (3-8-3) to a draw, but it is still 10 points out of the playoff picture with the season nearing the halfway mark. The wide-open game featured 34 shots – 19 for the Sounders, and 15 for the Fire. Seattle goalkeeper Stefan Frei and Chicago’s Richard Sanchez each came up with six saves, some of the dramatic variety. Sanchez denied Bruin on a prime opportunity in the 77th minute. Frei countered three minutes later when he ventured out to the top of the box to stop Fire co-leading scorer Nemanja Nikolic, who was coming at him one-on-one. Chicago (5-7-5) went up 1-0 in the ninth minute. Brandt Bronico backheeled a pass to Aleksander Katai, who took control about 35 yards up from the goal. He dribbled to the top left of the penalty area restraining arc and fired a shot past Frei to the back right corner for his sixth of the year. It was Katai’s fourth goal in the past six games.